The total length of the Coast Path through Plymouth is a perhaps surprising 10 miles or 16 km between Jennycliff and the Cremyll Ferry, which forms the Coast Path link to Cornwall. The walk has an accompanying booklet, available locally, which points out not only some of the historic associations but also some of the features that have been specially erected to enhance the walker’s experience on the route. Plymouth is accessible by local and national public transport, and there are local buses to and from the beginning and end of the walk. The beginning and end of the walk can also be accessed by ferry; the Barbican is linked by ferry to Mount Batten on the opposite side of the mouth of the Plym while the Cremyll Ferry links with Mound Edgcumbe in Cornwall. Plymouth : all possible facilities. No stiles, almost completely flat. Landranger (1:50,000 scale): No 201 Plymouth and Launceston. Explorer (1:25,000 scale): No 108 Lower Tamar Valley and Plymouth. As it passes through Devon, the South West Coast Path is rightly renowned as a superb means of experiencing not only the County’s seascapes, but its landscapes as well. Cliffs, beaches, coves, valleys, woods, all these and more will form part of the Coast Path experience. However, there is also another side of the Coast Path, and that is its urban face. As well as the numerous small towns and villages, it also passes through some large urban areas. Walking these sections, while not having the same aesthetic impact as the rural areas, can often compensate with historic associations and nowhere less than in the length through Plymouth. 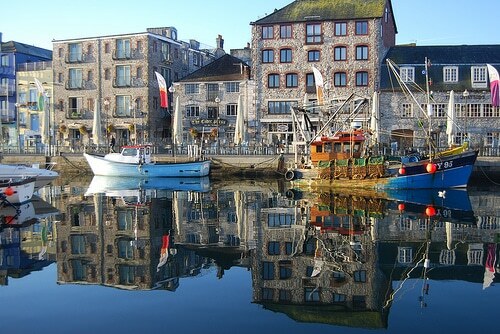 This walk concentrates on the central and most historic section, between the Barbican and the Cremyll Ferry. It is a linear walk, but both ends are served by local buses to and from the City Centre; alternatively neither end is very far from the City Centre if you wish to add to the beginning and end of the walk. Remember, also, that urban walks such as this are ideal during those winter months when the ground may be rather muddy in the countryside. The walk starts on the Barbican. This is the oldest part of Plymouth, boasting among other things a 16th century house. This dates from the time that the area was becoming the centre of the rapidly growing Plymouth which was based on Sutton Harbour. Note the memorial to the sailing of the Pilgrim Fathers in 1620. The piers have been rebuilt since those days, notably in the 1790s, but this rebuilding may well incorporate some of the pier which existed in 1620. The route is waymarked through Plymouth using white bands, often with a black acorn symbol, on lamp posts and by red metal signs. 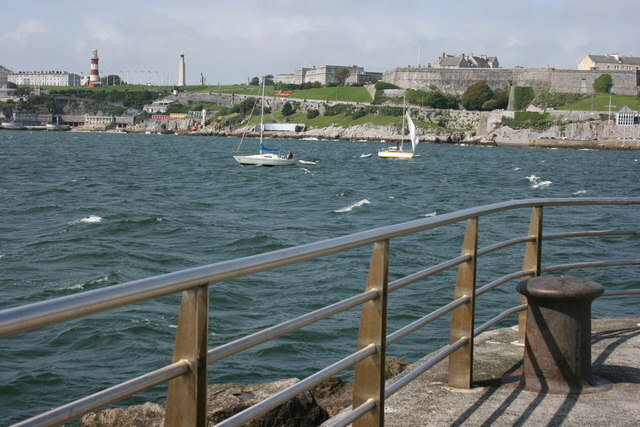 Some of the features created to enhance walkers’ experience of the waterfront walk in Plymouth may be seen a little way up the hill; a Madonna, the patron saint of mariners, salvaged from a lost cargo of marble and a carved marble scallop shell, indicating that Plymouth was an official port of embarkation for pilgrims to the shrine of St. James in Spain. Note the landmark on the pavement to the total eclipse of the sun which occurred in Plymouth in 1999. Above on the right are the walls of the Citadel, begun in 1666 by Charles II to defend Plymouth on the site of an earlier castle and fort. On the opposite side of the mouth of the Plym are Mount Batten and its breakwater. There was a settlement here in prehistoric times and more recently, in the 20th century it was a sea-plane base. The whole area has now been landscaped and is open to the public as a popular recreational area. Prominent on the Hoe is Smeaton’s Tower. This is the lighthouse built on the Eddystone Rocks, 11 miles/18 miles offshore in 1750. It was re-erected on the Hoe in 1882 after being replaced with a new lighthouse. The large and ornate shelter dated 1891, built for the benefit of those taking the sea air in Victorian times. The harbour, built in 1880, is a good vantage point to see Plymouth’s breakwater, sheltering the Sound from onshore gales. It was built by the famous engineer John Rennie between 1811 and 1841, and is said to have used 4.5 million tons of stone. Next to the path is the Royal Navy Millennium Wall, with representations of some of the Navy’s vessels. Behind is an imposing mid-19th century terrace, enjoying superb views over the Sound. On the left here is the “Wall of Industrial Memories”, a display of reclaimed and replica signs illustrating the rich industrial heritage of the Millbay Docks area. Look out here for the “gold bullion” on the pavement along Millbay Road. In the 1930s gold was frequently sent from London to the United States via Millbay Docks, and bullion awaiting shipment could be seen here then. Millbay Docks were built in the 1840s. Now a ferry port for France and Spain, transatlantic liners used the docks until 1939. There was a direct rail link into the docks from London, used by some of the 20th Century’s most famous figures, as depicted on the Wall of Stars. Walking past the blue railings here, look for a famous order given by Sir John Hawkins to his fleet off Spain in 1564. It is only visible at certain angles. Caroline Place has some nice 1830s houses. Stonehouse was originally an individual town, separate from Plymouth. Although much bombed between 1939 and 1945, it retains Plymouth’s most complete 18th Century street in Durnford Street, originally laid out in 1775. The barracks were built between 1779 and 1785. Towards the end of Durnford Street look out for quotations on the pavement from famous Sherlock Holmes stories. The author of these stories, Arthur Conan Doyle, lived for a short time with a medical practice in this street. On the left here is the Artillery Tower. Now a restaurant, the original tower was built in the 1480s, and then rebuilt in the 1530s by Henry VIII to protect Firestone Bay and the approach to Plymouth. Royal William Yard was built in the 1820s by John Rennie (who also built the breakwater) and is regarded as the most remarkable example of an early 19th Century planned layout of industrial buildings anywhere in England. It was built as the Navy’s victualling yard in a classical style, impressive but functional. It included mills, bakery, brew house and slaughterhouse. Note the statue of William IV over the gate.